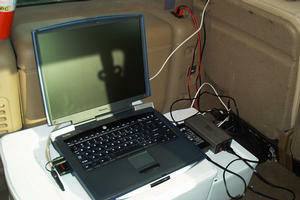 My Truck setup for PSK31 work. 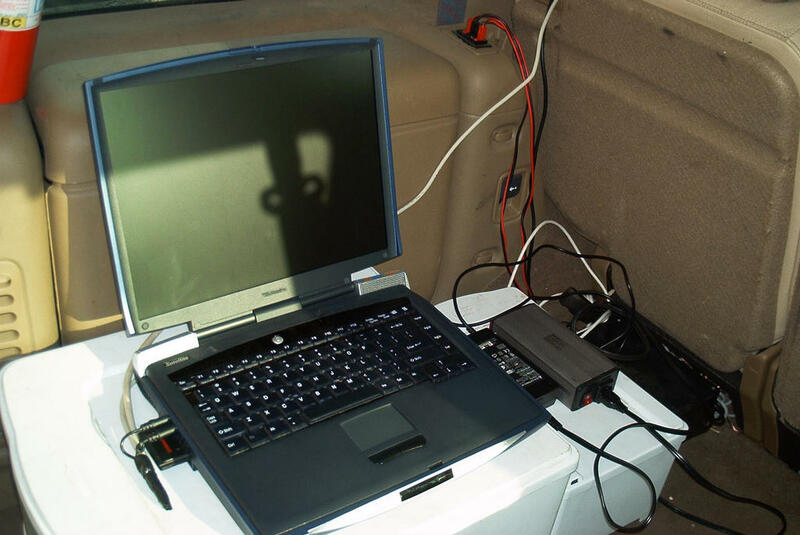 My computer setup for PSK31 in the truck. Ok, I'm totally jazzed about a new virtual toy of mine. It's an Amateur Radio technology called PSK31. It's basically morse code for the 21st century. This morning, I heard a guy (KB5DBR) in Oklahoma talking to a guy in Verginia, with only 40 watts of power! This would be one of the best toys for out in the middle of the desert yet. Most PSK31 work is done on 20 meters, and since I've only got a technician license, I can't transmit there. So, if anyone is interested in playing with PSK31 on 50.290mhz, 144.550mhz, or 432.2mhz PLEASE let me know. Within the next few days I'll be transmitting CQ's on those frequencies. Ok, it's been six months since I first started listening. I've had a workable tranciever setup for the last four, and I've yet to hear anyone on 2 or 6 meters. No one! I've even been transmitting 50 watt CQ's both on my vertical, and on my beam! Come on people! Where are all those geek/hams out there? KD7PLU / trooper (2003-01-23): Add some links for newbie PSK-31 info. I have an FT-897 that's collecting dust until I upgrade. Rich KQ9L (2004-07-31): Mobile PSK31, I love it!! 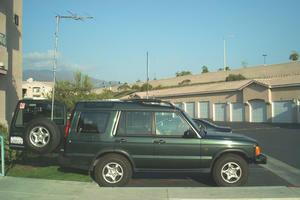 I run mobile CW from my disco, also do mobile QRP 5w CW. Love your site and what you've done with the DII. BCNU. Erik (2004-11-10): I can understand why 2m PSK-31 isn't popular. You just don't get the distance with 2m that you do with 20 or 40 meters. It's probably the biggest reason I want to get my general license. I think tonight will be my first time using PSK-31 on the 2-meter band. I'm going to try to hokkup with a couple of local friends, just to see if my new PSK-31 setup is working. I tried calling CQ last night on 20-, 40-, 80-, and 160-meters with no response. That was my first day on PSK-31, so I'm not sure if I have problems or not. We'll see. BTW, you can get your General class upgrade with no problem. Just do it! I was first licensed in October of 1995, then passed the Morse Code exam in May '06, then the General in June '06, and just two weeks ago i passed the Extra exam. DO EEEET!!! Erik (2007-03-12): Actually, the morse requirement has been dropped, just in the last couple of months. I fully intend to go to the extra class. Bob WA8YCD (2007-04-04): Good luck getting folks on digital. At least you're closer to some population. I'm out in the boonies and anyone doing anything more than just listening to the local repeaters are few and far between. In my current license class I'm trying to encourage them to try stuff like SSTV and APRS and satellite. Do the upgrade. Only 35 Q's. Then only 50 more. Just Do It! Joel W1 (2007-04-27): Nice power pole setup in the back of your truck. 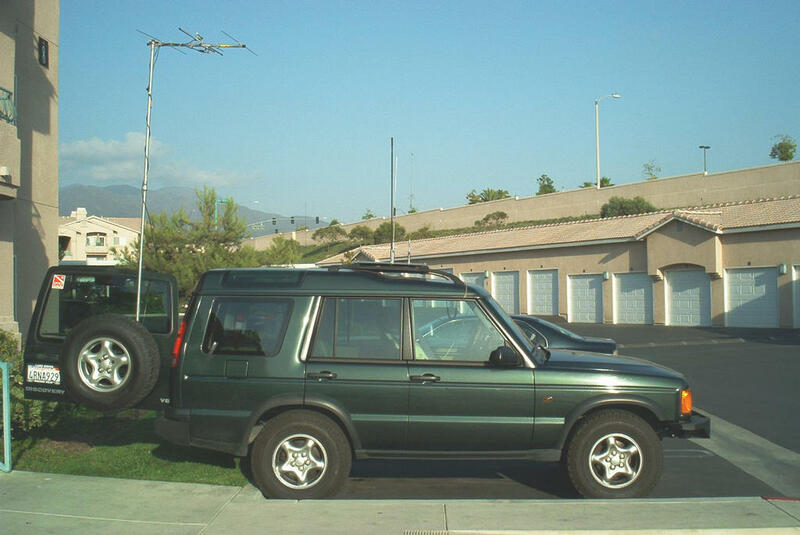 Alex Kaltsas (2008-10-08): I'm slowly building my station up to have APRS and 2 meter PSK-31 capability. I may upgrade to General Some time but I'm having fun dilling around with 2/440. I'm looking to do some 2 meter SSB but finding a reasonably priced rig is near impossible. I may break down and buy one of those MFJ SSB rigs. Duane (2008-12-02): I've been trying to hear some PSK on 144.550 using my iMac and MultiMode for OS X. Nada. Might not be setting it up correctly, but can find no instructions on how to do that. Gordon KB5JWJ (2009-11-30): Psk31 seemed to be the up and comming thing several years ago. Like the hula-hoop, It may have gone by the wayside. The last time I used it was to demo a digital mode for the Boy Scouts. It was good we had two rigs set up. tried some other free PSK31 programs, but none copied anywhere as good as DigiPan. Steve (2011-05-21): I work PSK31 and PSK63 on 20m, 17m, 15m, 12m, and 10m a lot when SSB just isn't getting through. I'll always get much further contacts with PSK and routinely work latin america, europe and russia. I'd like to work PSK on 2m and throw out CQ's on 144.144 on the weekends but have yet to make a contact and I live in a very large metro area.